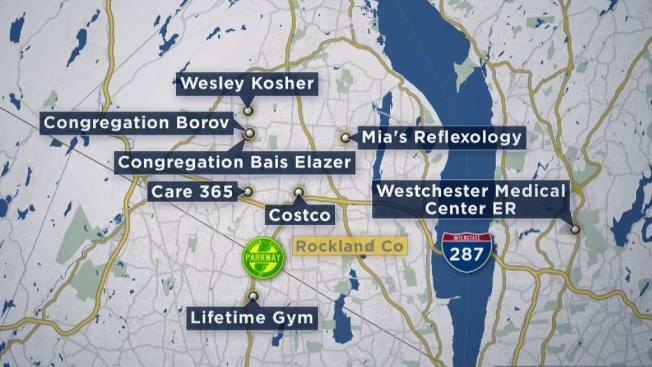 Rockland County officials say the public could have been exposed to two people with measles. Wale Aliyu reports. An international traveler with measles may have exposed people at several New York and New Jersey locations to the disease, health officials say. The traveler returning from Israel visited several venues in the two states between Oct. 4 and Oct. 11, the New York State Department of Health said on Saturday. Congregation Bais Elazer, on Voyager Court in Monsey, New York, on Oct. 4 between 8 a.m. and 11 a.m.
Mia’s Reflexology on South Main Street in New City, New York, on Oct. 4 between 7 p.m. and 9 p.m. Lifetime Gym on Van Riper Road in Montvale, New Jersey on Oct. 5 between 8:30 a.m. and 12 p.m.
Wesley Kosher on Route 306 in Monsey, New York on Oct. 5 between 10 a.m. and 1 p.m.
Congregation Borov on Parker Road in Monsey, New York on Oct. 5 between 6:45 p.m. and 9:45 p.m., and on Oct. 6 between 9 a.m. and 1:45 p.m.
Costco on Overlook Boulevard, in Nanuet, New York, on Oct. 7 between 1:30 p.m. and 5 p.m.
Care 365, on Main Street in Monsey, New York, on Oct. 8 between 10 p.m. and 12 a.m.
People with measles “first develop a fever, then may have a cough, runny nose and watery eyes, followed by appearance of a rash,” the health department said. Anyone who may have been exposed to the disease should contact their healthcare provide or a local clinic or hospital before they seek care, to keep others from being exposed, the department added.